kb.vmware.com – Life is not Accumulation, it is about Contribution. For most replication workloads, you will likely see compression ratios of approximately 1.6:1 to 1.8:1. 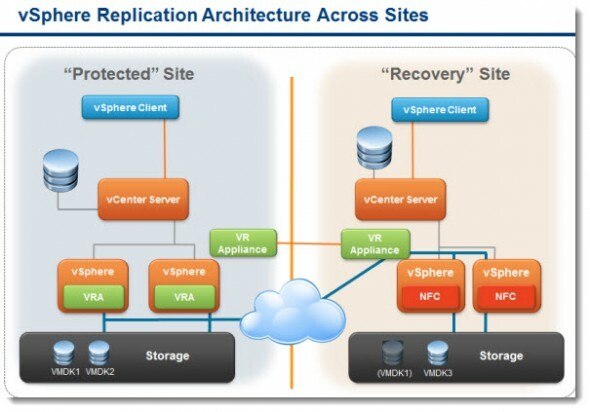 Q: What performance information is available about VMware vSphere Replication? A: Impact on virtual CPU performance for a virtual machine that is protected by vSphere Replication is approximately 2 to 6 percent. In nearly all cases, this is not an issue because the vast majority of virtual machines are not CPU constrained. Q: What performance overhead exists on the source hosts? A: The replication scheduler built into VMware vSphere uses an insignificant amount of CPU and memory to compute the replication schedule of all the virtual machines on the host. Q: What performance overhead exists on the target hosts? A: VMware vSphere® Replication virtual appliances receive the replication traffic. They utilize compute and networking resources in a manner similar to any other virtual machine. Additional storage load is placed upon the VMware vSphere hosts as vSphere Replication transfers replicated data to storage using the Network File Copy (NFC) protocol. During a full-sync operation, checksum calculation operations are distributed across multiple hosts to minimize CPU impact on any one host. Several factors influence where contention might occur. For example, if there is much bandwidth – 1Gbps, for example – the amount of NFC traffic might tax the host or even the underlying storage system. Inspired from Bayu’s email. Good Info to share with customers bro.